Derren – and Channel 4 – like his specials, so on 4th January 2006 The Heist was aired in the UK. 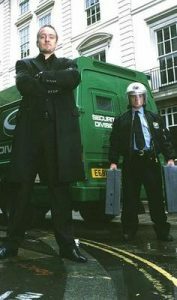 Derren seemingly made respondents to an advert he placed in a newspaper hold a security van up at gun-point, although the gun of course a toy gun and the security guard was an actor. There was rumours that the security van was actually made from plasticine but these were later shown to be unfounded. Four people were selected to carry out the robbery from an initial field of thirteen, with three of them actually carrying out the “heist”. Derren made the audience believe he achieved the effect by utilising an association of colour, music and phrases to seemingly put and build upon a highly-motivated state in which the participants in the hope take they would take part in a robbery, even those those involved were not explicitly instructed to do so. There were also references and a mock set-up of Stanley Milgram’s experiment which originally looked into obedience when under instruction of person considered to hold a position of authority. The initial Milgram Experiment yielded unexpected results and has been repeated many times in different countries, and is a widely accredited psychology experiment. The Heist is available on Channel 4’s All 4 On Demand service. Alternatively you can buy the DVD or stream via Amazon Video.